The November Class and Component Prices were announced on December 5. The Class III milk price of $20.83/cwt was down by only 1% from the October price of $21.02. 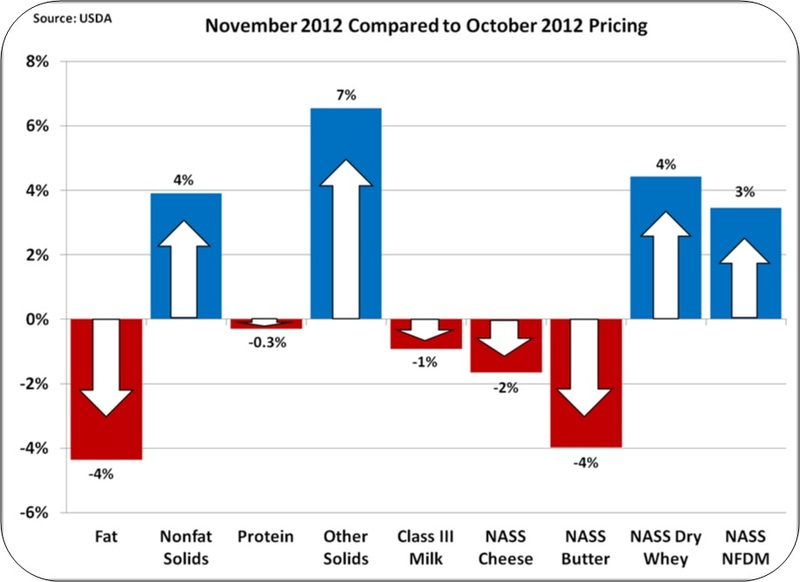 While both butter and cheese prices fell, protein remained high at $3.72/lb. Because butter prices fell more than cheese prices, milk protein prices remained almost unchanged, down only .3%. See the August 8, 2010 post for an explanation of this relationship. The long term component price trends are shown below. 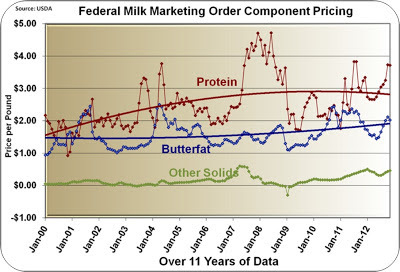 Milk protein continues to be valued well above the trend line at a value that represents historical highs, excluding the period in 2007/08 when protein was briefly priced above $4/lb. 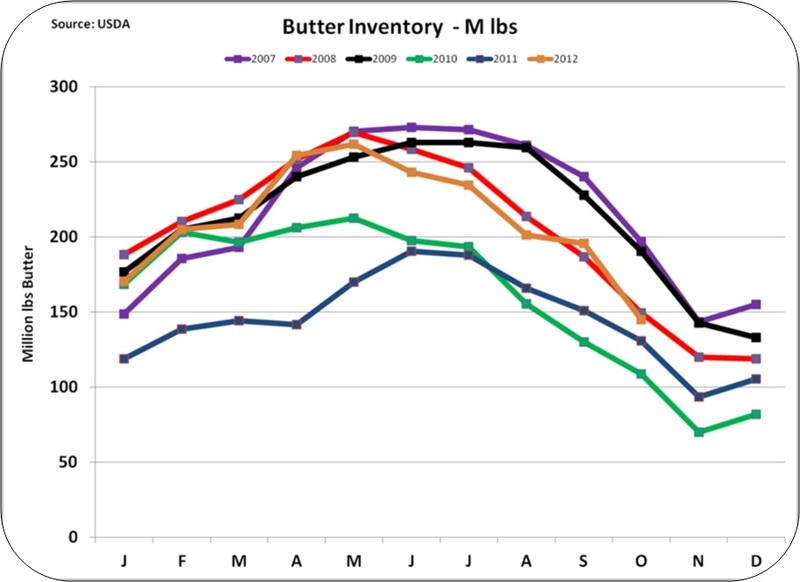 Butter prices did fall about 4%, but this has very little impact on the Class III milk price. The Class III milk price is dominated by the cheese prices as explained in the April 23, 2009 post to this blog. 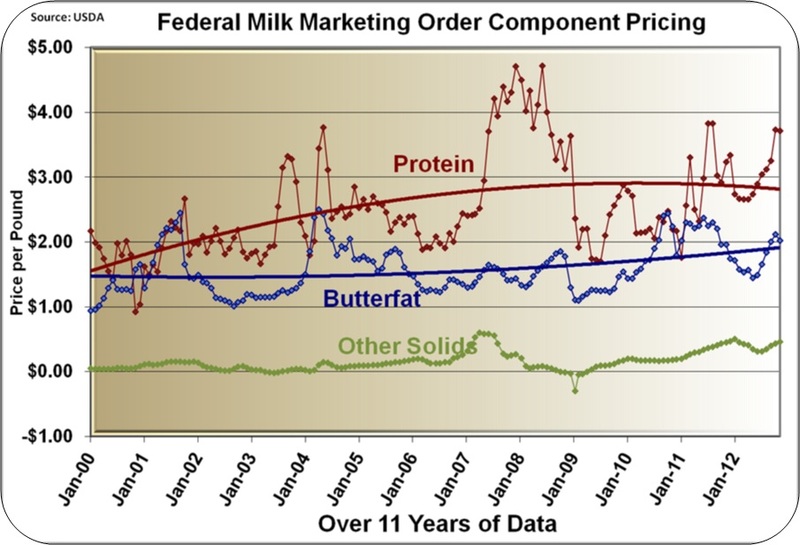 "Other solids" have not had much impact on Class III milk prices in the past, but the high price of dry whey is making the value of “other solids” a critical part of the Class III milk calculation. The price of "other solids" is determined by this formula. In the month of November, cheese, butter, and dry whey, contributed the amounts shown in the table below to the Class III milk price. By comparison, the contributions for November, 2009 are also shown. This illustrates the dynamics that are happening in dairy pricing. The math behind the calculations used in the table below is detailed in the August 8, 2010 post to this blog. 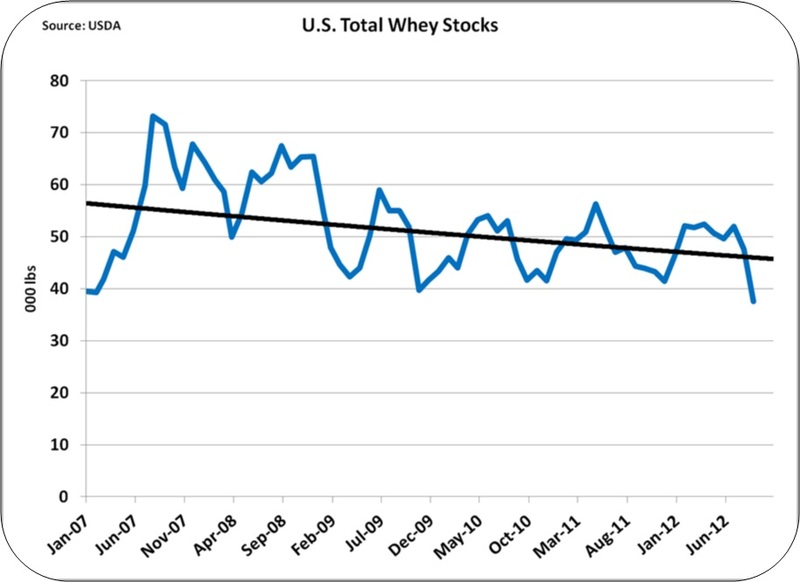 Over the last three years, the price of dry whey and therefore "other solids" has steadily increased. 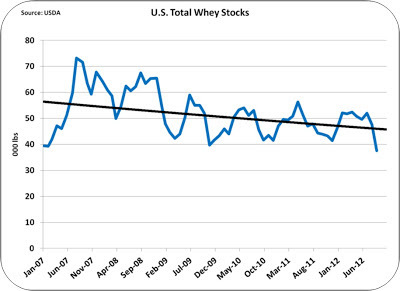 While cheese and butter prices have gone up by 33% and 32% respectively, dry whey has gone up 86%. In November, 2009 "other solids" made up 6% of the Class III price but by November, 2012, “other solids” made up 13% of the Class III price. Whey is being recognized more as a co-product than a by-product of cheese manufacturing and is establishing its value as a food product, not a by-product.. This is a market dynamic that may be permanently shifting the Class III milk prices. 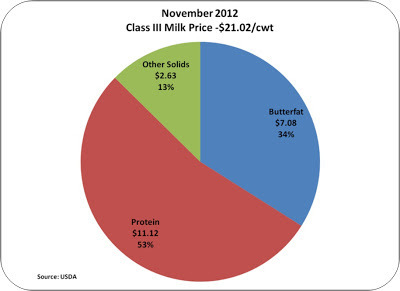 Assuming that it continues, it could have nearly a $2/cwt positive impact on the Class III milk price. Protein continues to dominate the Class III milk check and milk protein development remains key to a producer’s revenue. 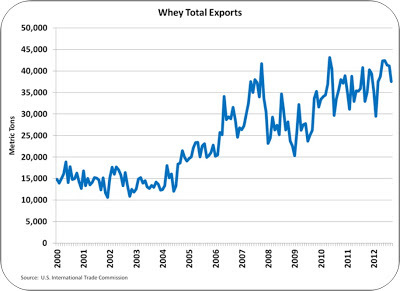 Whey exports remain high helping to keep the "other solids" price high. Because whey is a by-product (or co-product) of cheese production, the available volume of dry whey is determined by the amount of cheese produced. The amount of whey produced is nearly equal to the amount of cheese produced on a solids basis. At the current time, 40,000 metric tons of whey are being exported every month. By comparison, there is about 20,000 metric tons of cheese exported, which on a dry basis would amount to about 12,000 metric tons of cheese solids. The disappearance of dry whey is clearly driven by exports. This has created an increasingly tight supply of dry whey. As stocks are depleted, the laws of supply and demand result in increased prices. 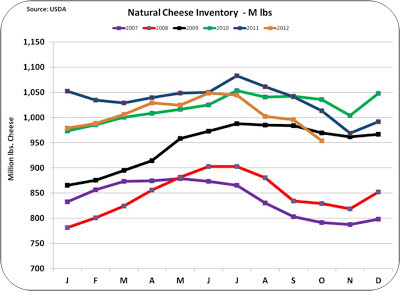 Cheese prices as reported by NASS are currently high at over $2/lb, but they are falling rapidly. The cheese price is the most important parameter for Class III milk pricing. The November NASS price for cheese was $2.01/lb. By comparison, the December 7 price for barrel cheese on the CME is $1.66/lb and block cheese is $1.76/lb. This would indicate that NASS prices may fall by 15% in the month of December. CME cash prices for cheese lead the NASS prices by about two weeks. 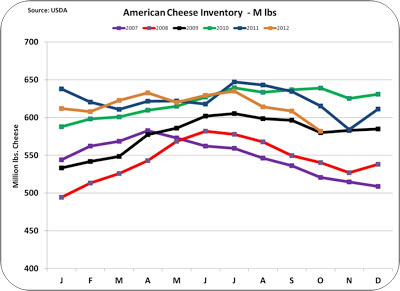 The drop in cheese prices is unusual considering the relatively tight inventories reported for October. Cheese production remains consistent with long term trends, and exports remain well above prior year levels. Because the reporting of cheese inventories and exports lag, this analysis lacks current data, but as of the most recently reported data, there is nothing that should be driving down cheese prices as much as is currently happening. 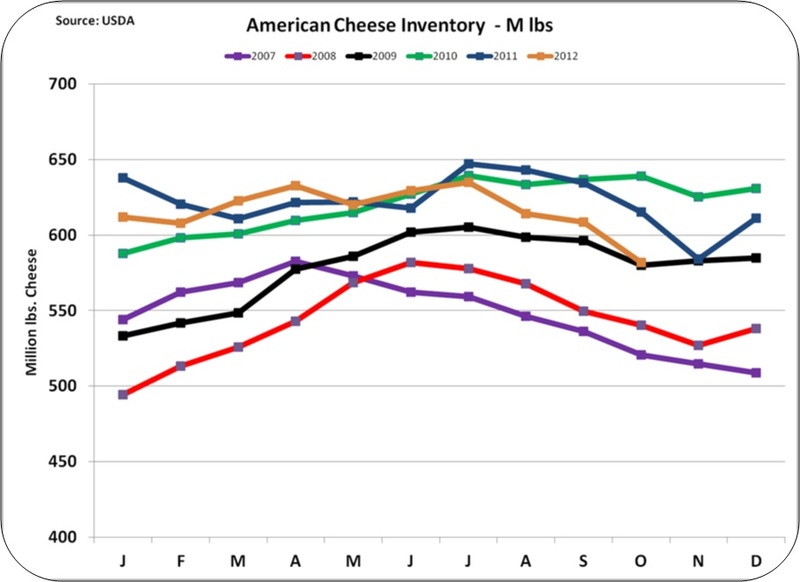 The drop in cheese prices currently occurring seems to be inconsistent with other data, so it may be short lived. However, for now it is real and future Class III milk prices are dropping below $19/cwt reflecting the lower cheese prices. 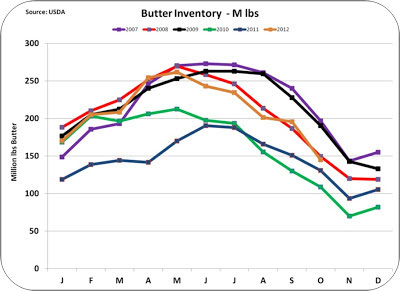 Butter prices calculated by NASS were $1.84/lb for November. Current CME cash prices are at $1.61/lb or 13% below the reported NASS prices. Although butter prices have a lesser impact on Class III milk prices than cheese, this would also suggest that December milk prices will be well below October and November prices. This price decline is also unusual as butter stocks remains at reasonable levels. WHERE ARE MILK PRICES GOING? Class III milk prices are headed for their own fiscal cliff beginning in December. The futures prices show a continuation of lower Class III milk prices beyond December. However, because exchange rates remain favorable and inventories for cheese, butter and dry whey are not high, it seems reasonable that the drop in future Class III milk prices that exist at the present time may moderate or at least not deteriorate further.